11. Szechwan Long Beans at Nick + Stef's - To say most of America's great steakhouses' side order menus are a little long in the tooth is an understatement. Here's potatoes. More potatoes. 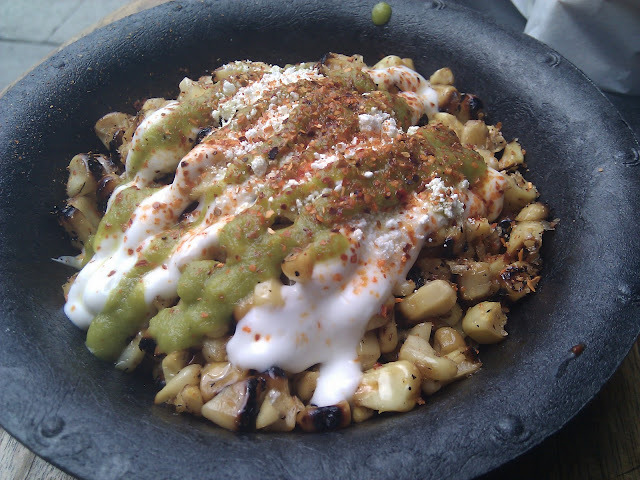 Even more potatoes. Here's potatoes with cheese! That's what makes Nick + Stef's so special. On top of hearty meat cuts, they offer the most eclectic steakhouse side order menu in town. 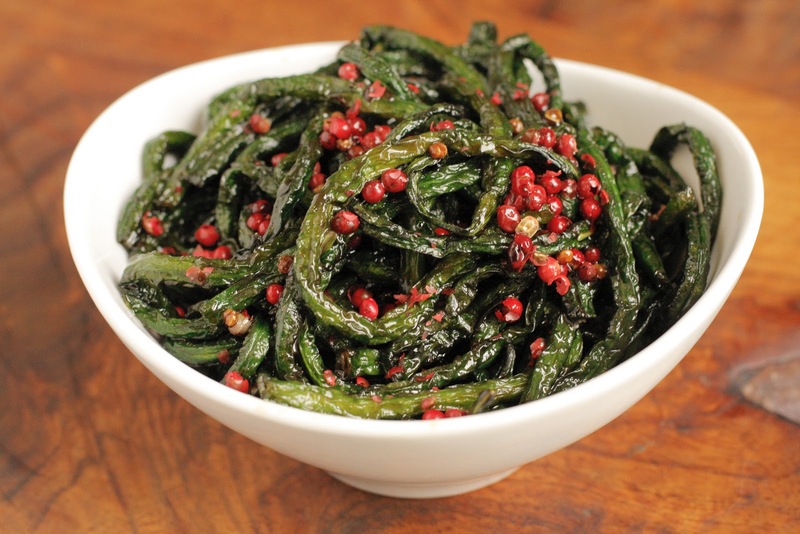 The star: the Szechwan Long Beans, perfectly roasted with a slightly spicy sauce and those beautiful pink peppercorns could make anyone, man or woman, love pink for a dinner's length. 10. 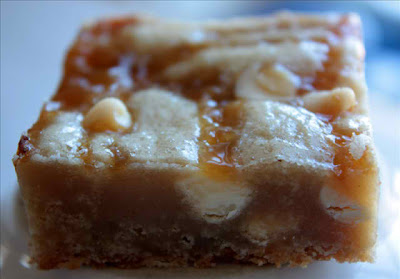 White Chocolate Caramel Blondie from Embrace Sweets - Embrace Sweets does brownies better than anyone in LA. Their hiddem gem? The brownie's slutty stepsister, the Blondie. 9. French Toast at M Street Kitchen - When I was young my Dad would joke I ate so much French Toast I could write a book about it. If this tome ever comes together, Page One, Chapter One would feature M Street Kitchen's cinnamon-candied French Toast. 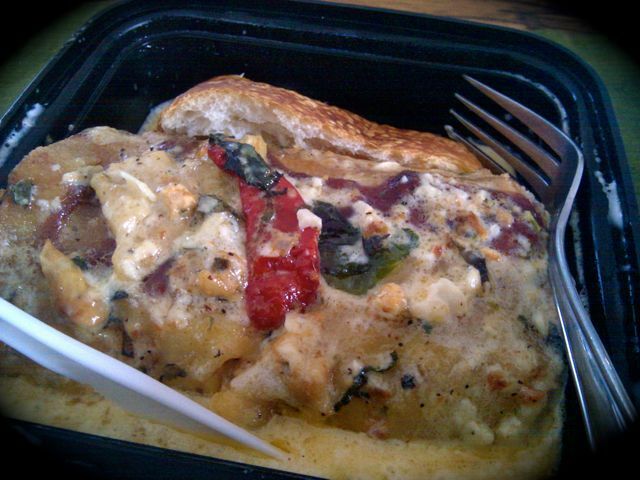 It's so good that as you ingest it all you can do is dream about eating it again next weekend. 8. Squash Salad at Huckleberry - If a (gag! ewww! no thanks! salads are for girls!) salad makes the U.E. Top 11 of the Year, it must be good. It doesn't even possess large amounts of a manly protein! 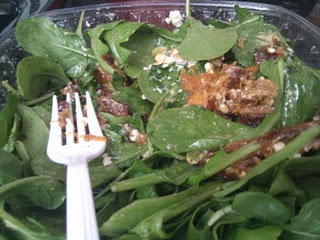 That doesn't stop Huckleberry from putting together the perfect unisex salad: arugula topped with butternut squash, Niman Ranch bacon shreds, pumpkin seeds and feta with a red wine vinaigrette. 7. 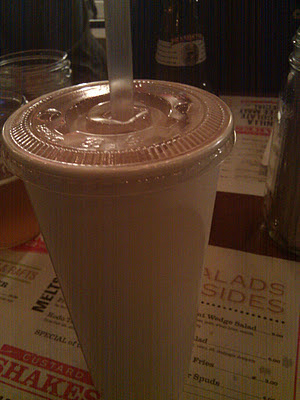 Chocolate Milkshake at Short Order - Despite being a tad underwhelmed by Short Order's burgers, my friends and I were certainly overwhelmed with the rich chocolate taste of their Chocolate Milkshake. It's a milkshake you write home about... while drinking said milkshake. 6. 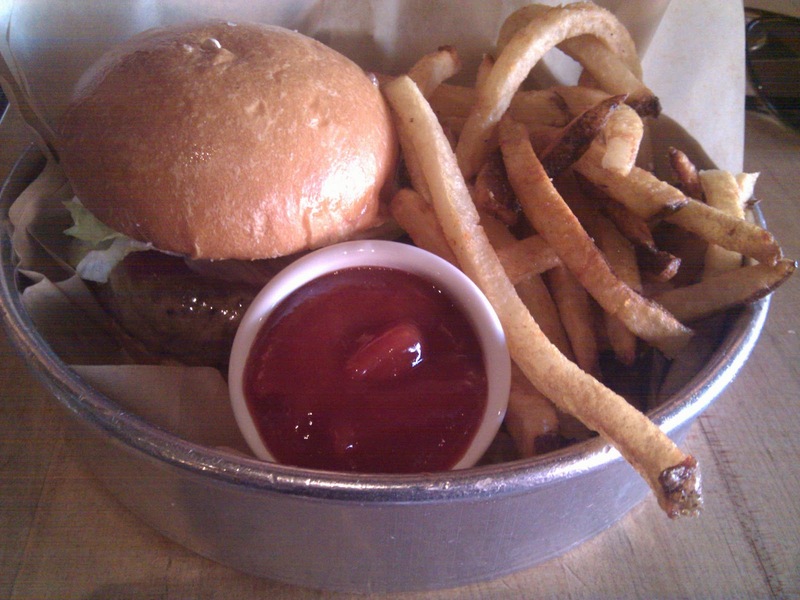 Hickory Burger at Laurel Tavern - If one were to design an Unemployed Eater food pyramid, it would probably only need be bi-levled. BURGERS and everything else. So, that said, it came as quite a surprise that the new (to me) burger I enjoyed most in 2011 came from the Valley of all places, but Laurel Tavern does their burger right. The Hickory is a 8 oz. patty topped with cheddar, caramelized onions and an Apple Pan-esque hickory sauce. Note: price is for burger alone; fries extra. 5. 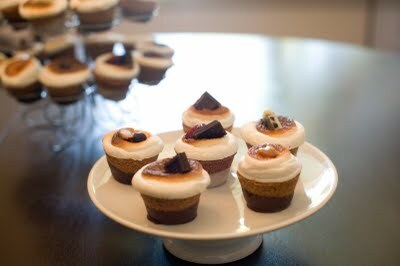 S'Muffin from Gotta Have S'more - Steps to take if you meet someone who takes a bite into the s'more-cupcake-muffin-cheesecake graham cracker crusted-hyrid S'Muffin and isn't immediately infatuated: 1) Punch this person in the face, 2) Eat the rest of their S'Muffin. 3. Crostini at Milo + Olive - Two weeks ago U.E. 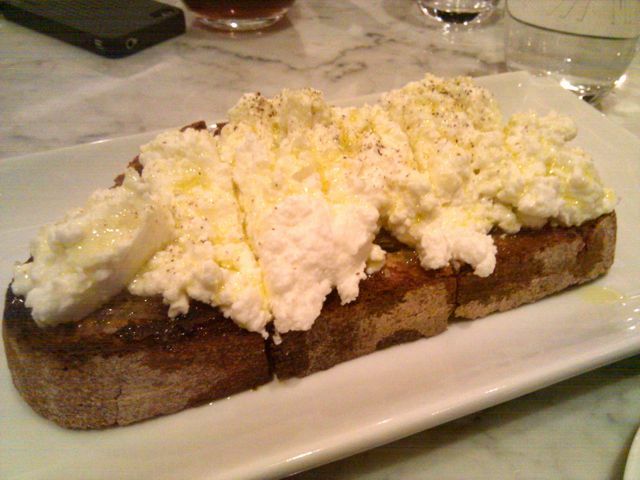 raved about the Milo + Olive pizza, but the dish soon not forgotten is not the pizza, but rather the Crostini -- mountainous amounts of sheep's milk ricotta with EVOO and a touch of sea salt atop Zoe Nathan's famous bread. 2. 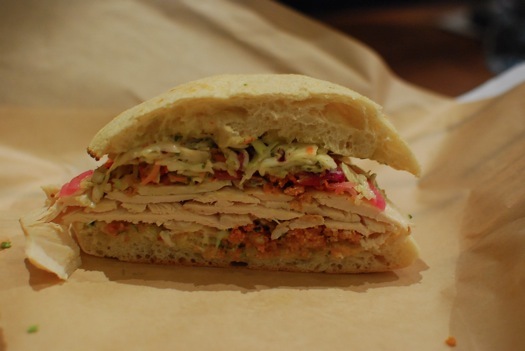 Fried Chicken Sandwich at Son of a Gun & Not So Fried Chicken Sandwich at Mendocino Farms & Pesto Chicken Sandwich at Soda Pop's (TIE) - Chicken Sandwich Haters often claim their disdain for the sandwich lays in its "blandness." As a Chicken Sandwich Lover, I do not disagree. But, those are ordinary chicken sandwiches. 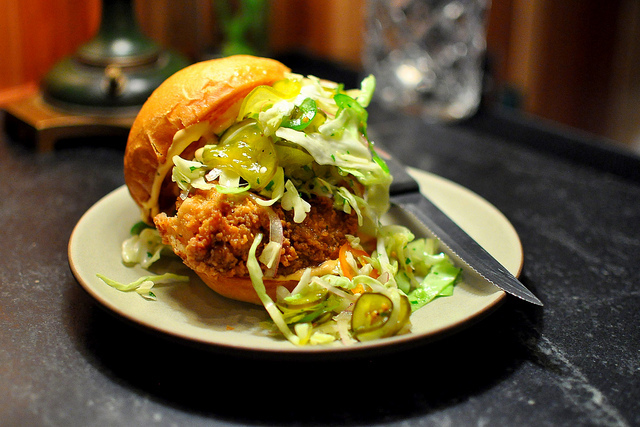 Certainly not ordinary, ho-hum chicken sandwiches: Son of a Gun's Fried Chicken Sandwich, Mendocino Farms' Not So Fried Chicken Sandwich (ASK FOR IT ON RUSTIC WHITE - TRUST ME) and Soda Pop's Pesto Chicken Sandwich. All excellent and tasty in their own right, they are the sort of chicken sandwiches that would make even the coldest hearted Chicken Sandwich Hater into a Lover. These pictures look amazing! 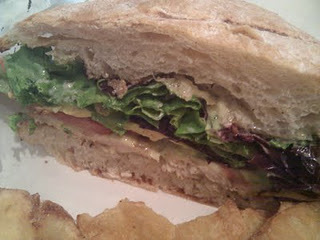 I can't wait to try all of these spots in 2012! Well, dammit. Now I want a S'muffin.